The site also offers other graphic model products and John uses it as a "one stop shop"
You can partially back up with your "browser back button" to select different times without needing to reenter the access code, but you will need to re-enter a new code to change locations. The big advantage is that you can view multiple graphic products from multiple forecast models for any location you enter, and you can look pretty far into the future, compared to the VGB balloon which looks at the past. Note: reviewing Skew-T sounding graphs for different locations can be cumbersome and time consuming but they are often one of the best tools to visualize the atmospheric profile. It is time consuming to configure, so once you tunnel in, you don't want to loose your place. To view multiple models for comparison, see [strategy] below. or you can simply enter SBA for the Airport. 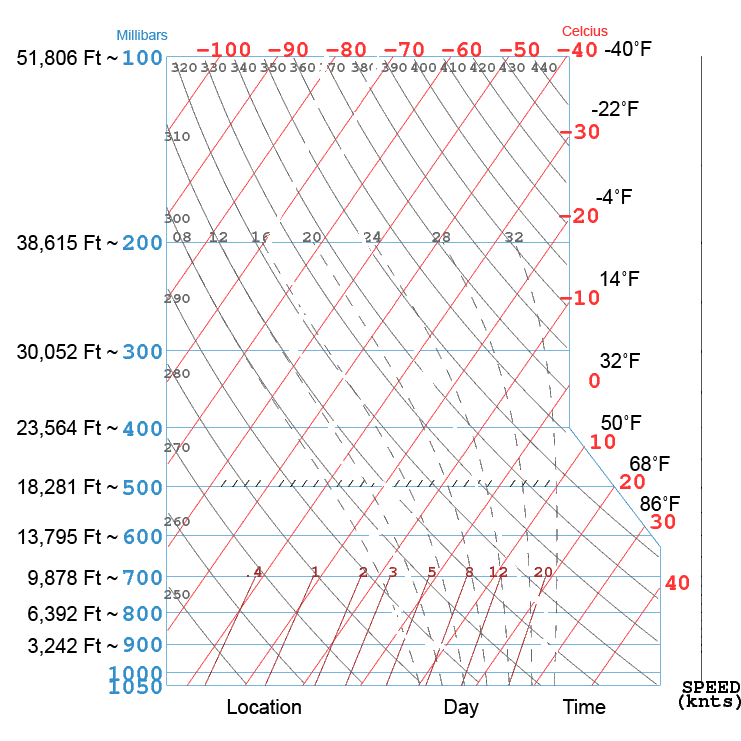 but the soundings look at weather above the surface. but I haven't studied the inner workings of the models. Select a model under the drop down list for "Soundings"
will also look at 15-UTC and 00-UTC (8 am and 5 pm) if I have the time and want to see the progression. We don't launch at 8 am, but are often in the air at 5 PM on good days. You can click your browser back button to change the date and time, but you can't jump to a different model or location without starting over. You can save the GIF image files which will let you record several forecast times for a particular model without having to re-enter coordinates and access codes. If you are going to save the images for comparison, then it's better to use just one window and back up with your browser back button so when you right click on an image and select "save image as", it will default to your last directory tree location and you won't need to tunnel in from your default "save-to" location. I recommend using a file naming scheme that will sort and group, then when you save an image you can click on the last image saved name and simple edit the time in the file name. The file naming scheme I use is "model" "sounding date and time" "for" "location" "day" "time". I use UTC time as designated by z but use 24Z for 00Z in the afternoon. Example file name: nam_2017_11-29_12z_for_ojai_29_21z, which translates to the NAM model run on November 29th, 2017 at 12Z (4 am PST) for Ojai on the same day (the 29th) at 21Z (1 pm). Then the if I want to save the next time, I simply copy the file name and change the 21Z to 24Z. To group and sort, I keep our local days together, so the NAM time in the image will progress from 29_21Z to 30_00Z, but I'll use 29_24Z. If I'm at the end of the month, then I'll add days to the month, for example, 29, 30, 31, 32. After saving all the images I'll sometimes put the different locations in different sub-folders, then when I open with a viewer, I can have multiple viewer windows open, one for each location, and toggle through in the location's time sequence without getting too confused about which location I'm looking at.